As expected price has entered a corrective movement. It has been choppy and overlapping, exactly as a fourth wave should be. Minute wave iv may be unfolding as a double combination in order to show structural alternation with minute wave ii. So far within the combination the first structure, minuette wave (w), is an expanded flat correction. I do not expect that minute wave iv is over at the low of 21.002 labeled minuette wave (w) for two reasons. It would be much briefer than its counterpart minute wave ii at only seven days compared to 18 days. Secondly, it would show no structural alternation as both would be expanded flat corrections. Within minute wave iv minuette wave (x) may take any corrective form, although X waves are most commonly zigzags. I expect minuette wave (x) to move price sideways in very choppy overlapping movement for a few days. Minuette wave (y) may be either a zigzag, triangle or flat correction (in order of probability). 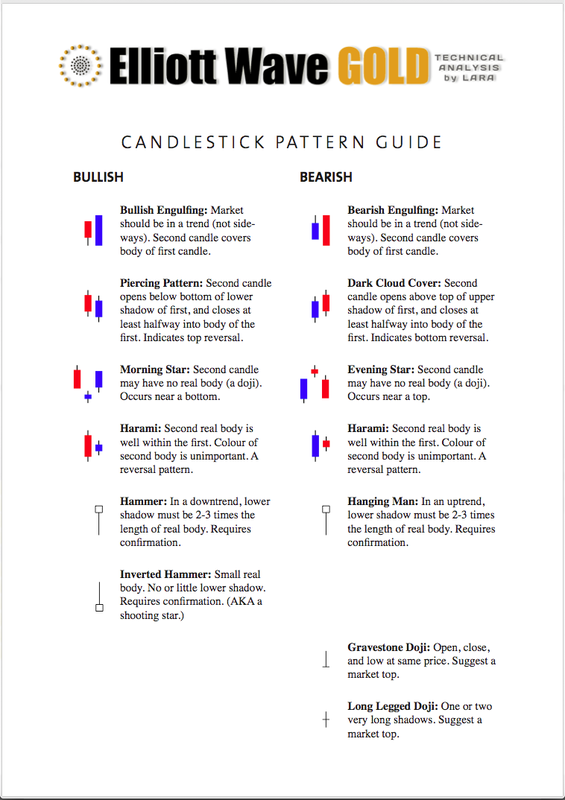 If it is a triangle or a flat then it should move price sideways. Overall I expect more very choppy overlapping movement for minute wave iv for about another two weeks. The structure of minuette wave (w) looks clear. It subdivides perfectly as an expanded flat correction. 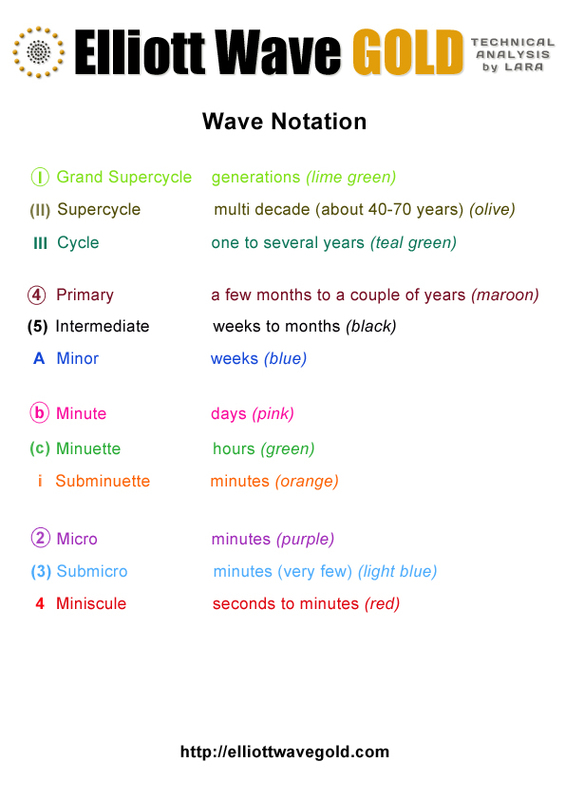 Within it subminuette wave a is a three wave zigzag, subminuette wave b is a three wave zigzag and a 132% correction of subminuette wave a, and subminuette wave c is 0.114 longer than 1.618 the length of subminuette wave a. From this point I would expect minuette wave (x) to move price sideways for a few days. However, while price remains within the channel containing subminuette wave c downwards I have no confidence that subminuette wave c is complete. It may move price lower. Only when this channel is clearly breached would I have confidence that minuette wave (x) has begun. 1. 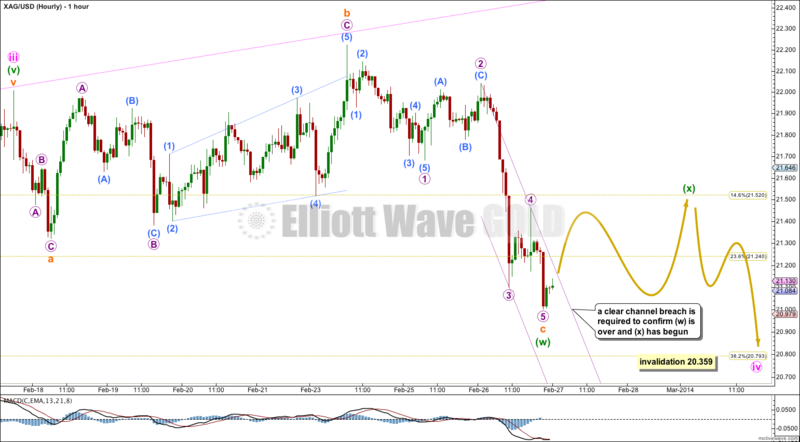 I am currently expecting Gold to move lower in the beginning of a B wave. The start of this B wave may be very choppy and overlapping. It does not have to trend strongly downwards because it is a B wave and not an impulse, and it is corrective. 2. I am expecting Silver to move sideways. This is entirely possible in conjunction with Gold moving slowly lower. 3. 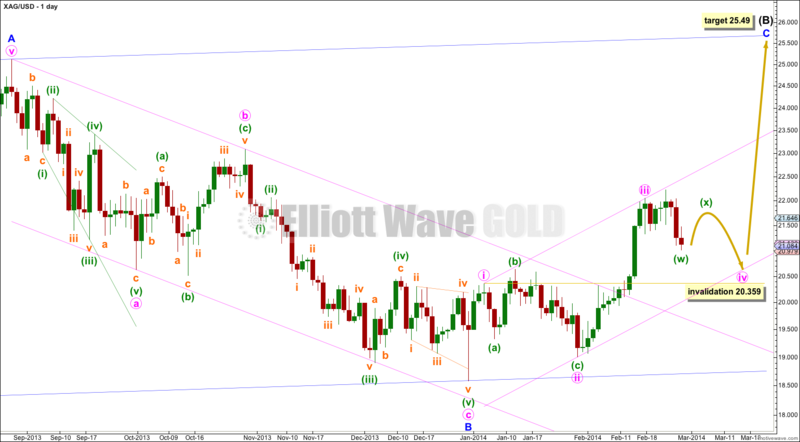 My main wave count for Gold may be wrong; the alternate may yet prove to be correct. At the time of publication I am still waiting to see a clear channel breach of the smaller green channel on the daily chart for Gold. Prior to that channel breach I have made it clear I do not have confidence in a trend change for Gold. 4. Silver could still move lower and we must accept this possibility while price remains within the channel on the hourly chart. 5. Notice that Gold and Silver recently diverged: Gold made its last high on 25th February while Silver had made its high two days earlier on 23rd February, and on the 25th of February Silver moved downwards to a greater degree than Gold did. It is not true to say that they always move in tandem. It is only true to say that they mostly move in tandem. Overall I am expecting that both markets are at this time in a corrective phase. In that point they do not significantly diverge. I agree with your thoughts on gold and silver movement. I think the same can be said that the miners, ie. GDX, mostly move in tandem with gold. From my observations, turn dates and move intensity may vary, sometimes significantly.